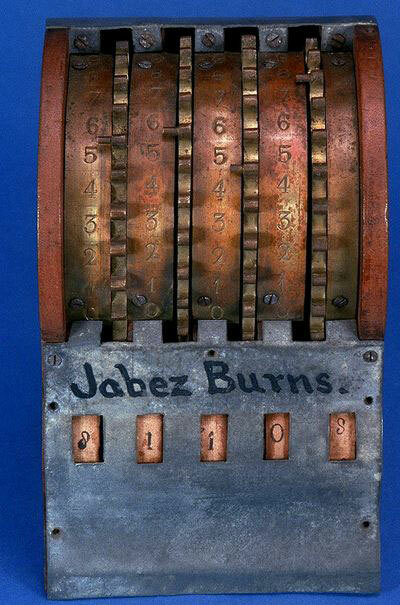 On August 24, 1858, Jabez Burns (1826-1888), an inventor from New York (see biography of Jabez Burns), took out the US patent №21,243 for a machine for adding numbers. 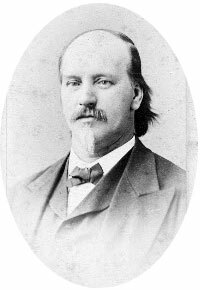 The device obviously never went into production, and only the patent model survived to the present time (property of Smithsonian National Museum). The device is a small 4/5 positional addometer (adder) (4 digits in input, and 5 digits in output mechanism), made by wood, tin, brass, and paper; measurements: 16 cm x 38.7 cm x 12.2 cm. It is a simple lever-set adding machine with wooden sides and metal covers for the back and the lower front (see the lower photo). The four large toothed wheels (visible on the front side), are used for setting numbers, with five registering wheels in front and below these. Between each of the large wheels there is an inscribed strip of metal, with the digits from 0 to 9 indicated along the edges of these strips. 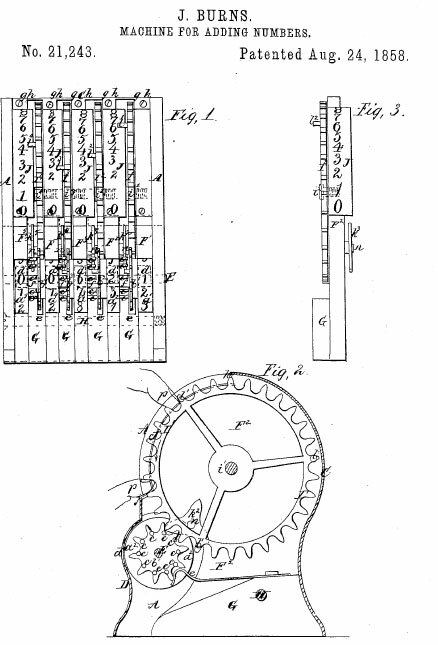 Each of the four right registering wheels, divided into ten parts, is attached to a spur wheel with ten teeth that meshes with a large toothed wheel. Placing a finger in one of the teeth of a large wheel and rotating it forward advances the registering wheel proportionally. The number entered is visible in a row of windows at the front of the model. The four registering wheels to the left have on their left side a ring of ten equidistant pins that are used in carrying.